9 YEARS LATER: Average age now 80? How have these groups fared? How many vocations did they have last year? How are the Nashville Dominicans doing? How are the Ann Arbor Dominicans doing? How are the Intercessors of the Lamb doing? How are the Missionaries of Charity doing? How are the Disciples of the Lord Jesus Christ (Prayer Town, Texas ) doing? How are the Franciscans of the Eternal Word doing? Photo at left: Sister of Mercy makes her temporary profession. Faced with aging nuns and few new vocations, the 175-year-old Sisters of Mercy religious order – with six communities in California — has decided to undergo a major reorganization. The “shrinking and aging of the order” is one factor that brought about the restructuring of the Institute of the Sisters of Mercy of the Americas, reported the April 11 Catholic San Francisco, the weekly newspaper of the San Francisco archdiocese. The Institute’s six California communities will merge with communities in the West and Midwest into an Omaha, Nebraska-based organization called the West Midwest Community. The restructuring was approved at a meeting in Chicago, March 24-30, and will take effect July 1. The new organization will bring together 861 Sisters of Mercy and 525 associates. The Institute itself, covering the Americas, Guam, and the Philippines, numbers 4,194 sisters and 2,800 associates. The average age of sisters in the institute is 73. Though the vocations office has “been very active across the Institute,” Liz Dossa, spokeswoman for the Mercy Sisters in Burlingame told Catholic San Francisco, its efforts have not been fruitful. The number of candidates, novices, and temporary professed in the West-Midwest Community is four, though “several women” are in the process of joining, Catholic San Francisco reported. Among the needs to which the Mercy Sisters have been dedicated over the years are education, health care, parish work, spiritual direction, and social services. The ministries the Burlingame community has been involved in include Mercy High Schools, Catholic Healthcare West, and Mercy Center. 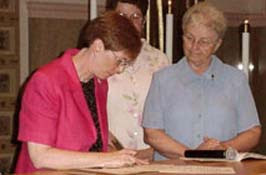 A “progressive” Catholic community, the Burlingame sisters were listed in Call to Action’s 1999 “Church Renewal Directory,” as among groups that “support the spirit of Call To Action’s 1990 ‘Call for Reform in the Catholic Church.’” Call to Action, which calls for women’s ordination and for Church acceptance of artificial birth control and the normalcy of homosexuality, has five regional chapters in Northern and Southern California. Did Pastor Steve Hickey finally become Catholic yet? Whenever you start to see Evangelicals writing about de-population and asserting their pro-life sentiments… The writing always seems to be on the wall. You are currently browsing the The Black Cordelias blog archives for April, 2017.